Like other parts of the World Pakistanis are also crazy about Cricket and as the Cricket World has came near the excitement about Cricket has increased even more. Pakistani Cricket suffered badly in 2010 due to Spot fixing scandal and other troubles but Pakistani fans are hopeful for a good performance by their team in World cup by forgetting the past. 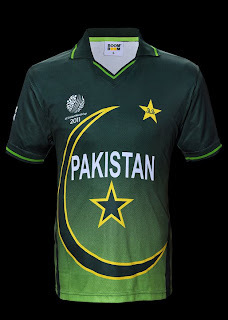 Following is Pakistan Cricket Team Official Kit For World Cup 2011 that is revealed yesterday by Pakistan's Team Sponsors Boom Boom.